The Cardinal Archbishop of Lyon, Philippe Barbarin, officiated at a strange ceremony on October 17, 2015, at St. Martin's Catholic Church, a parish in south Lyon. Indeed, the ceremony consisted of a “confirmation” ministered to 10 Catholic and Protestant high school students of the area. Actively present was also Protestant minister Françoise Sternberger. Actually, the Catholic students were confirmed by the Cardinal and the Protestant students renewed their baptism vows and received a “blessing” from Sternberger. It was a bold ecumenical step to give the deceitful impression that both the Catholic Cardinal and the Protestant minister have analogous powers of orders to confer the Sacraments. In itself, the ministering of the Sacrament of Confirmation to those Catholics was incoherent, since the purpose of Confirmation is to make a Catholic a strong warrior for Christ, defending Him and the Catholic Church against His enemies. Now then, among these enemies are the Protestants, who are heretics for denying many dogmas of the Catholic Faith. 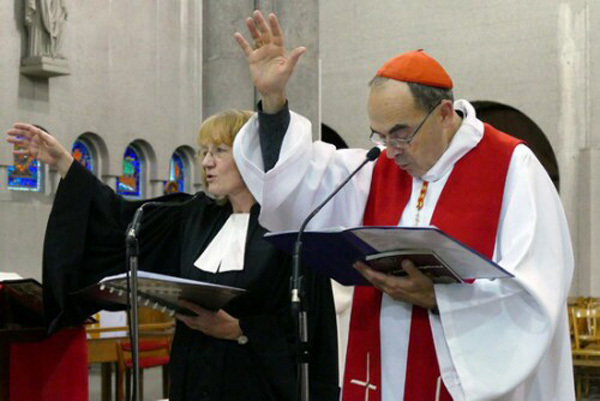 Therefore, Barbarin's Confirmation ceremony, made alongside Protestants, aimed to produce the opposite effect, that is, to make Catholics tolerant of Protestants. Since 1974, St. Martin's Church has been a place where vanguard ecumenical initiatives take place. One of them has been an ecumenical catechesis for youth, which, of course, hs omitted the dogmas denied by Protestants. It is not difficult to see that the heretical infection of religious indifferentism is being broadly spread by Barbarin following the guidelines of Vatican II and Francis. It produces most deleterious consequences for the formation of Catholics and the constitution of families, which are often mixed marriages between Catholics and Protestants.